Actor Name, Actor Name, and Actor Name in Works & Process - Holiday Concert. BOTTOM LINE: Presenting large, dynamic sound in a wholly unique space, the Works & Process Holiday Concert is a tradition not to be missed! The Holiday Concert in the Rotunda, a beautiful annual part of the Works & Process series, presented a gorgeous platform for the world premiere of the newly commissioned classical piece Blake Fragments by Sebastian Currier. Emotionally charged and gracefully dynamic, Currier’s new work bounced in the curves and swoops of the Guggenheim’s dazzling rotunda. Commissioned by the Works & Process series, the piece moved with characteristically cluttered, highly syncopated movements, ending in surprising, poignant silence. As part of the Holiday Concert in the Rotunda, it was both boldly new and firmly rooted in tradition, much like Currier’s other work. Contrasted with classic English holiday songs, the experience captured the comforting familiarity of Christmas with the newness of a modern approach to sound. Sung in four parts by conductor George Steele’s Vox Vocal Ensemble, Blake Fragments features musical text taken from the poetry of William Blake. In the voices of Vox Vocal, and amplified by the physical space, the words take on otherworldly significance. Emotionally charged and daringly abrupt, the songs feel like an alien transmission, beautifully lofted through space. Currier has a celebrated CV, and has received many awards for his bold approach to tempo, including the Berlin Prize, Rome Prize, a Guggenheim Fellowship, a fellowship from the National Endowment for the Arts, and an Academy Award. His piece was joined by a composition for voice and piano by John Corigliano, Christmas at the Cloisters. With an unusual and rich body of work, Corigliano has received the Pulitzer Prize, the prestigious Grawemeyer Award, four Grammy Awards, and an Academy Award and has been performed and recorded by many of the most prominent orchestras, soloists, and chamber musicians in the world. Christmas at the Cloisters presents a carol of piercing vocal atonality, set against celebratory discord and resolution. Unconfined by traditional progressions or notions of classical music, the avant garde focus of Corigliano’s work is on full display in the piece. 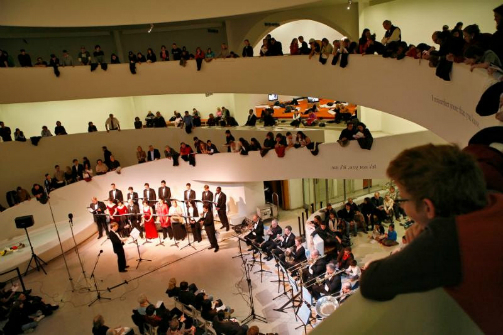 Founded in the early 1990s with the explicit focus on performing music from both the sixteen and twentieth centuries, Vox is one of the most sought-after vocal ensembles in New York, which makes their presence in the Guggenheim Museum’s majestic Frank Lloyd Wright-designed rotunda a true pleasure. Warm, resonant tonalities expand to dizzying heights in the Rotunda space, highlighted by the fact that the group sings while they process down the building’s circular ramp, combining classic Christmas music like "The Holly and the Ivy" and "In the Bleak Midwinter" with carols for all to sing, including "Once in Royal David’s City" and "Joy to the World." The room fills with the bright warmth only possible when a group of many people get together to sing with no reservation. Guggenheim's established music and performance series Works & Process has brought over 400 productions of diverse, acclaimed artists from around the world. The Holiday Concert, an exceptional opportunity to experience the Guggenheim in a novel way, features a combination of new music and traditional holiday classics that captures the spirit of the season. Works & Process Holiday Concert featured compositions by Sebastian Currier, John Corigliano, and George Steel. Conductor is George Steel. Vocal Ensemble is The Vox Vocal Ensemble. Produced by Mary Sharp Cronson.